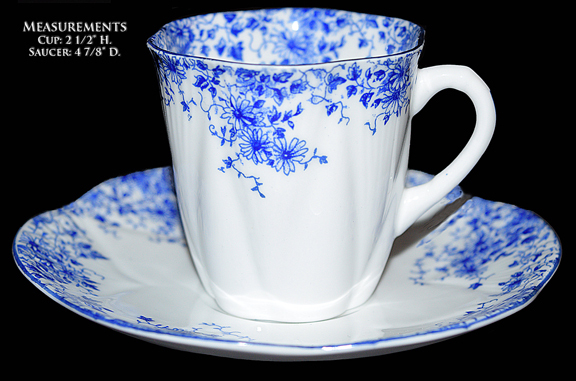 Condition: This fabulous Shelley Danity Blue demitasse cup and saucer set is in Undamaged Condition without chips, cracks, or mold damage. The decoration is done nicely. The colors are vivid. Cup Measurement: 2 1/2" H.
Saucer Measurement: 4 7/8" D.
Marks: On the Cup -"Fine Bone China" "Shelley" in a rectangular box. Beneath the box -"England" And below that in pink " Danity Blue 051/28". Please take the time to look at the backstamp on the saucer in the photos. Dainty Blue The dainty blue pattern is commonly found on the Dainty blank. This beautiful pattern was one of Shelley's most popular patterns and is highly collectible today. 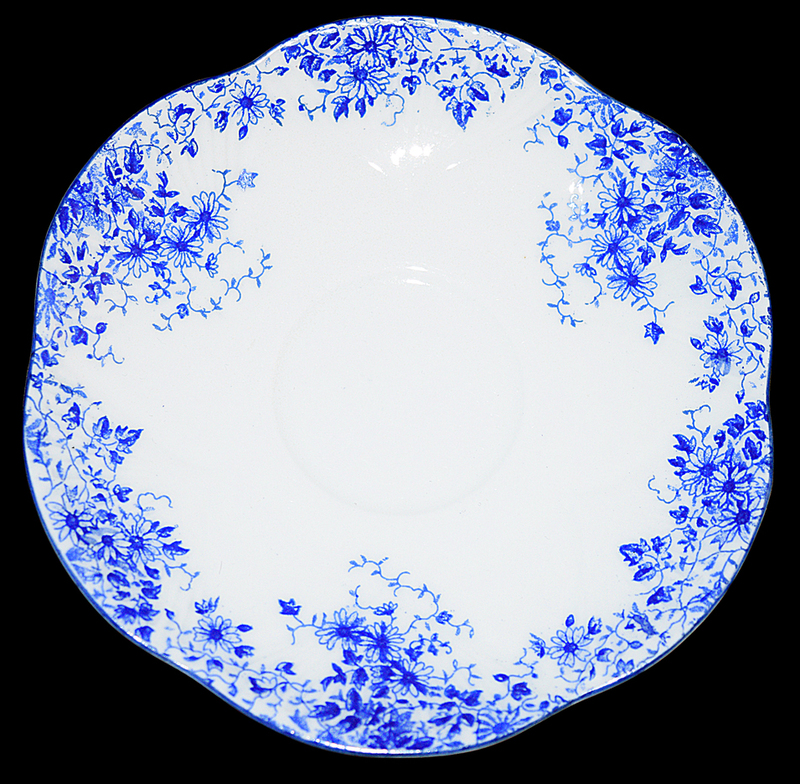 Numerous serving pieces are available in this pattern as well as a full service dinnerware set. The Wileman & Company Foley Pottery Company Shelley Pottery - In 1827 a man named John Smith established a group of factories that became know as the "Foley Potteries Factory." Later, Henry Wileman purchased the company and called it Wileman & Co. These companies are the basis for the pottery that later became known as Shelley. which is both durable and delicate. 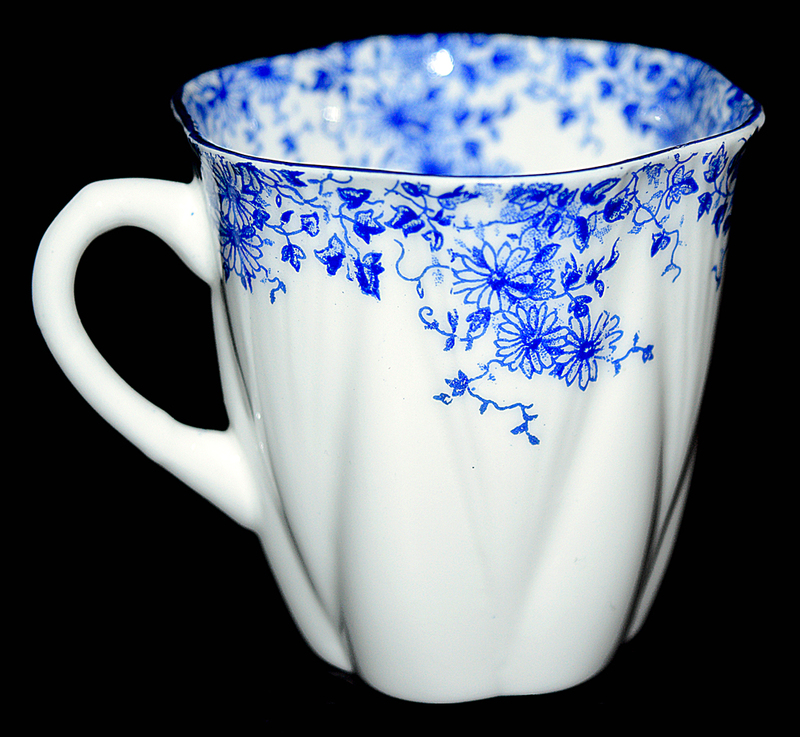 Throughout the years many beautiful patterns have been created and this Staffordshire England Pottery has been one of the most popular sources of fine china. Shelley creations grace many beautiful households and are avidly collected today. In 1860, the Foley Pottery Works constructed a second plant. At this time the companies were known as the Foley Pottery works. During the early 1860s James B. Shelley left a position at Dresden works and joined Henry Wileman and his two sons Charles and James. Mr Shelly's position at this point in the company was as a salesperson. With the death of Henry in 1864 his sons took over and ran the two potteries; James supervised the first factory (earthenware) and Charles ran the newer china works. In 1870 James died and Charles took James Shelley on as a partner in the business. Shelley was determined that his company would produce the very best china available. Percy Shelley, son of James, became interested in the business and became a part of the firm. He ran the company for the next 50 years, and took over where his father left off. He employed top pottery artists and litho designers. He was determined to improve the overall quality of their pottery. The elegantly styled dainty shapes that we know today as Shelley were created while Percy was head of the company. During this time the pottery was known as Foley Pottery, but due to a legal battle around 1910 the company was renamed Shelley. In 1925 the name became official. Largely due to the work done by Percy, the company continued to grow and prosper. Many new patterns and shapes were added in the 1930s. By World War II only the china side of the company remained in production. 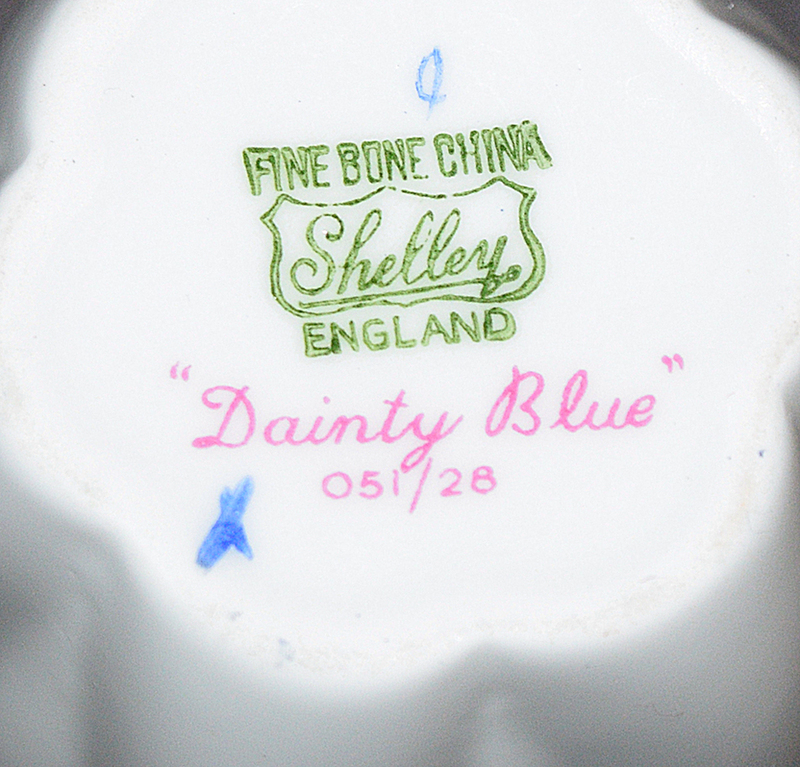 Sometime during the mid-1940s Shelley began producing most of its finer China for export. Shelley became a name renowned worldwide. While many companies shut down during the war Shelly was able to continue to production due to its large export business. The 1950s post war sales were phenomenal and Shelley continued to grow and expand. The mid 1950s were Shelley's peak years. Unfortunately with the arrival modernization and automation more companies were able to produce quality china at lower prices. Shelley's more expensive hand made china was often overlooked when price became a issue. 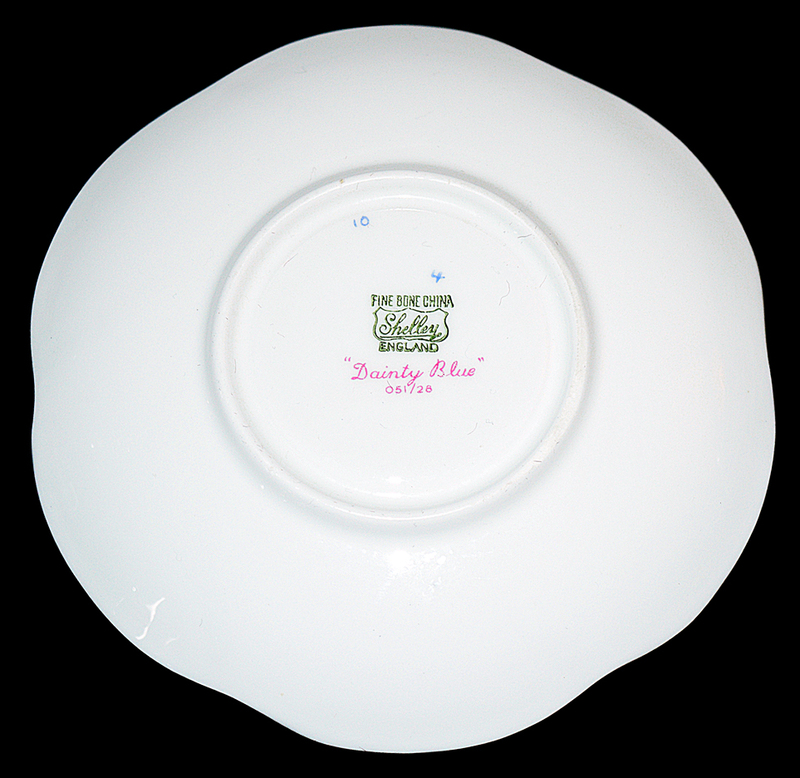 In 1966 Shelley was sold to Allied Potteries and production of Shelley's labeled china was discontinued.